Mrs. Dora Cruvant, a former resident of Jefferson City died Friday in St. Louis after a long illness, it was learned by friends here last night. 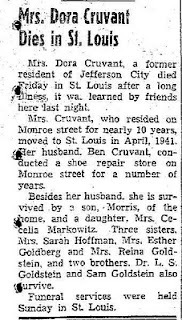 Mrs. Cruvant, who resided on Monroe street for nearly 10 years, moved to St. Louis in April, 1941. Her husband, Ben Cruvant, conducted a shoe repair store on Monroe street for a number of years. Besides her husband, she is survived by a son, Morris, of the home, and a daughter, Mrs. Cecelia Markowitz. Three sisters, Mrs. Sarah Hoffman, Mrs. Esther Goldberg and Mrs. Reina Goldstein, and two brothers, Dr. L.S. Goldstein and Sam Goldstein also survive. Funeral services were held Sunday in St. Louis. 1) Dora was born in 1888, in Lithuania, and her husband, Ben was born in 1883 in Lithuania. However, I believe they met in St. Louis, where they were married in 1912. I knew Ben and Dora were in Jefferson City in 1934 and 1937. However, I wasn't sure when they moved there and when they moved back to St. Louis. 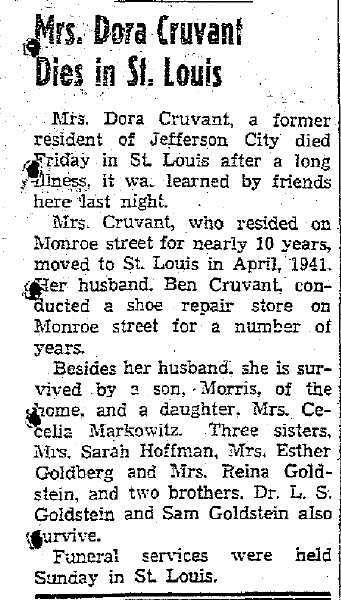 This obituary seems to suggest they moved to Jefferson City shortly after 1931, and returned to St. Louis in 1941. 2) "Of the home," in an obituary means that the individual lived with the deceased. Morris Cruvant (1920-1987) would have been 22 at the time. Cecelia (1916-2001) would have been 26. John, this isn't a comment about the obituary but a question about format. I'd like to know how you put the pale grey line above and below the transcription. I like how it sets it off as something different than the rest of the post. Thanks. Nancy, in Blogger, make sure you have selected the HTML editing tab, and type <HR>. This stands for Horizontal Rule. Thank you, John. I appreciate your answering and sharing this information.